With the most advanced skateboard deck ever built, the Inboard M1 is packed with futuristic and never- before seen features, which comes at a fancy price! On the outside, it looks like just another ordinary skateboard, but will astound onlookers with its speed and power. With integrated taillights, a tracking app, RFLXX remote and swappable battery, it has been strategically designed for the safety of the user as well as the board. 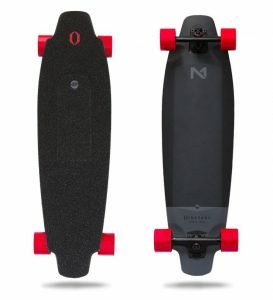 What’s more, is that it has upgradable performance, with new updates releasing over time for the remote, wheel technology and the mobile app, which makes the M1 leave all the other boards in the dust! Is Inboard M1 Safe Enough? How Cost Effective Is Inboard M1? The board looks rather ordinary, the regular black deck with red wheels. The deck is made of a mixture of 3D Poplar Wood, with ABS side plates, cased with fiberglass sheet like those of snowboards. It has tail bumpers, TPU nose point, and a restructured truck, and is yet very light in weight! The deck isn’t too flexible, thus giving stiff and rigid support. The e-board has dual in-wheel motors, with special Manta Drive Technology, thus assuring a soundless smooth ride. There are four bright LED lights, at the head and tail, for better visibility in the dark. The tape on the deck spans the entire length and breadth, for enhanced stability and better grip. It also comes with an RFLX remote, which is easy to grasp and stays in your hand even if you aren’t holding it properly. The remote has excellent throttle control, and uses BLE to collaborate with the board. The board is very light, being just 6.5 kg, and is aircraft approved. There are 4 riding modes, and the board as a whole, is splash resistant. All in all, the board is also wear and tear resistant, incorporating regenerative braking for a safe ride. The M1, is a simple board with power packed features which entrances everyone who rides it. It has an interchangeable PowerShift battery pack, which takes just 90 minutes to charge. The best thing about this battery pack is that you can easily swap it in seconds, and can ride on for as long as you please (provided you have enough packs of course!). This uninterrupted range makes the M1 unique and special! A charged pack would give you around 10 miles at the max, depending on your weight and skill-including the ride mode. The gearless, beltless and limitless Manta Drive Power Wheels, along with the Dual Brush Motors give you a crazy speed of about 22 miles per hour! The remote uses the new Bluetooth Low Energy module, giving it excellent connectivity as the accelerometer and with the app. With 15% hill grade, it makes it seem almost effortless to ride uphill with the board, while maintaining constant speed! If all this isn’t exciting enough, the M1 is refined over time, with updates where its speed can be increased, and the remote being more purposeful! The M1 come with integrated high contrast LED headlights and taillights, for better vision of the road at night, and also for other drivers on the road to notice it. The lights don’t eat up much of the battery, and stay brightly lit as long as the battery dies out. You could also vary the brightness as you please. By looking at the design of the remote, it’s clear that the M1 was well thought out, keeping the safety of the rider as a main concern. The remote fits perfectly in all hands, and you don’t have to hold on to it tightly while riding, nor fear it falling out of your hand when you brake suddenly. It has been ergonomically designed as an extension of the rider’s hand, and is easy to control. The board is splash resistant, and comes with built in motors in a sturdy casing, which reduces the exposure of the powerful tech to the environment for wear. 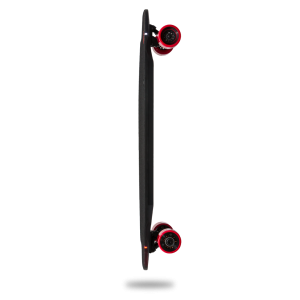 It also has strong grip tape for stability, and can support up to 113 kg/ 250 lbs. in weight! The M1 comes with swappable battery packs, much like a power bank of sorts, so that you don’t get stranded fearing that you’ll have to walk back home with the board! We’ve established that the M1 is, very safe, and it comes to cost, it’s is totally worth the price! It has world class high tech systems and support, with very advanced features! The integrated lights, the remote, and the app make it a one of a kind. Also, there is no need to worry about it becoming outdated, as it can be continually upgraded for no extra cost! The shipment comes with a fully assembled board, RFLX remote including its hard case and USB charger, 1 PowerShift Battery, a PowerShift charger, and a soft carrying bag along with a skating tool for customization. It also has a quick user guide, and an instruction manual for fixes to be made. All these exciting products come in a package worth about $1,400 only! It’s certainly easy to see that the M1 has thus blown all the other boards in its range out of the competition!